Getting everything done – both personal and professional – during the holiday season can be tough. The Postal Service is stepping in to help you out by offering seven day a week delivery in major cities and high volume areas beginning November 17th through Christmas day. They expect double digit growth of their package services during this period – up roughly 12% over the same period last year. The expectation is that they will handle 450 – 470 million packages. This is in large part due to continued e-commerce growth and improvements to Priority Mail services. 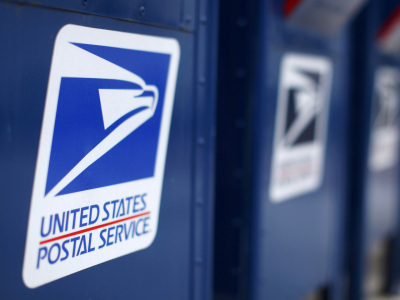 USPS’ competitors recently announced increases to their services, while the Postal Service lowered some of its prices for businesses and other large shippers. The reduced Priority Mail pricing has affordable options and improved tracking ability. With the continued growth of online retailers, more products are shipped directly to consumers. Next week’s blog? Our annual guide to holiday shipping tricks and tips! Can you believe it’s been 238 years since the establishment of the United States postal system? Yep, that’s right. The postal system (as it was originally called) was approved by the Second Continental Congress on July 26, 1775. There were no post offices in early colonial times, so mail was typically left at inns and taverns. Nearly all mail was from overseas as the colonists had no need to send correspondence “locally”. Mail deliveries from across the Atlantic were sporadic and could take months to arrive. Today the United States Postal Service® delivers more mail to more addresses in a larger geographical area than any other post in the world. 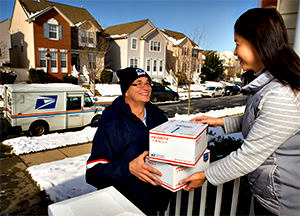 They deliver to nearly 151 million homes, businesses and Post Office Boxes in every state, city, town and borough in this country. Everyone living in the U.S. and its territories has access to postal products and services and pays the same postage regardless of location. 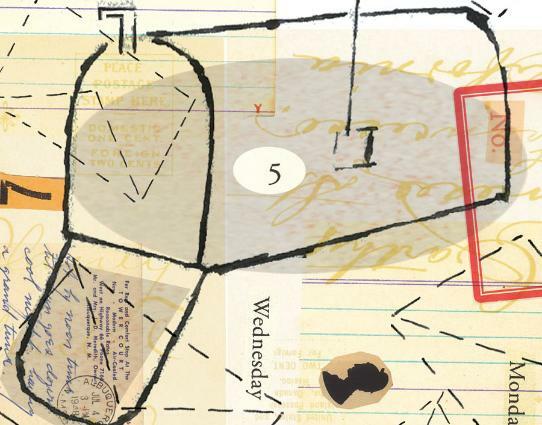 Before the internet, before email, texting and video chatting, there was the Postal Service. Take a look at photos from the Smithsonian Institute’s archives and watch how our mail system has changed as transportation and technology has changed our world. The “Chesapeake,” a USPS steamboat. Owney was a stray that walked into a post office in upstate New York where he fell asleep on a pile of mailbags. Presumably he became attracted to the scent of the mail because he began following them on mail wagons and then trains. 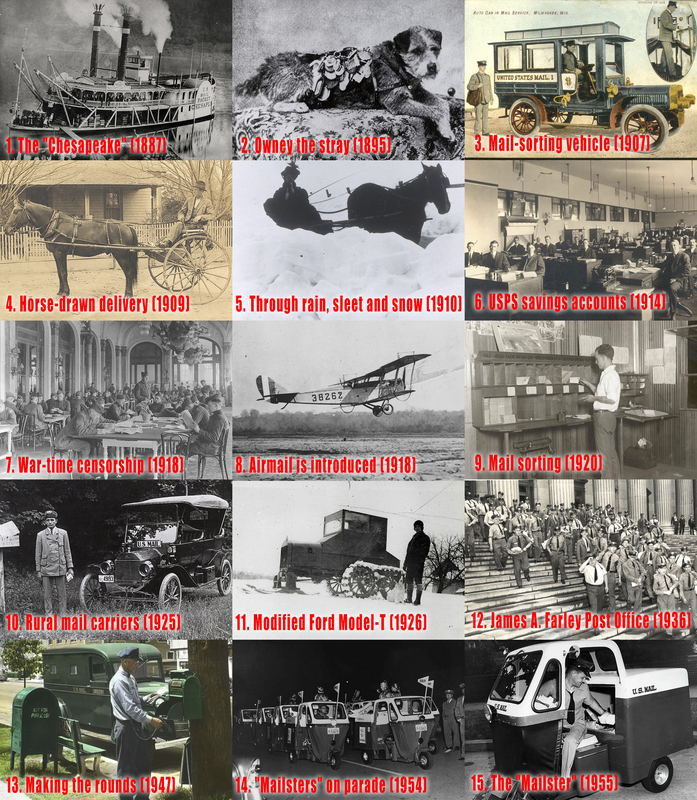 Only two of these mail-sorting vehicles were in service in Wisconsin. They carried mail sorters around as they sorted mail between offices. Posing for a picture on a horse-drawn delivery carriage, a carrier shows off his modified seat with a sling to carry the day’s mail. Using a horse-drawn sleigh, a female mail carrier makes her morning rounds in deep snow. Ending in 1966, the USPS offered savings accounts to customers looking to hold money in a federal institution with the convenience of the location of a post office. During the first World War, the U.S. military began large-scale mail censoring to remove information that could aid the enemy. The first USPS plane takes off in Washington, D.C. to begin the service’s airmail. A post office mail-sorter puts mail into pigeon holes for Hazelton, NJ, Bellefonte, PA, Cleveland, OH, Bryan, OH, Iowa City, IA, Omaha, NB, North Platte, NB Cheyenne, WY, Rock Springs, WY, Salt Lake City, UT, and Elko, NV. Unlike city carriers, urban mail letter carriers had to provide their own transportation such as the Ford pictured. Though they weren’t required to wear a uniform, the unidentified carrier in this picture purchased and wore one on his routes. A modified Ford Model-T fitted for carrier service in inclement winter weather. At the James A. Farley Post Office Building in New York City, mail carriers head out on their morning rounds. Postal workers would collect mail from tree-mounted boxes. To introduce their latest three-wheeled carrier vehicles and celebrate the holidays, postal workers organized an appearance in a parade in Maryland. A city “mailster,” a three-wheeled motor vehicle that was introduced following the second World War to help transport the ever-growing amount of mail. City letter carrier seated in a three-wheeled “mailster” motor vehicle. Carriers used these vehicles to carry the ever-increasing amounts of mail that was being delivered to American households after end of the Second World War. Did you know there are training courses and certifications offered by the USPS to help you grow and develop in the mailing industry? The USPS currently offers two certifications – Mail Design Professional (MDP) and Executive Mail Center Management (EMCM). These courses are not only for Mail Center Managers and industry insiders, but anyone who designs mailpieces, manages a mailing/postage budget or wants to help their own customers improve their mailing programs. The Mailpiece Design Professional (MDP) Online program teaches mailing industry personnel how to design mail to enhance its compatibility with U.S. Postal Service® automated equipment. It also coaches mailers on how to achieve lower postage prices through automation. MDP Online training is 100% free to all users. However, USPS® MDP certification is only available upon successful completion of course assessment, which does have a fee. The Executive Mail Center Management (EMCM) program is a comprehensive training program designed for individuals who wish to develop Mail Center Management skills. Training is offered at the NationalCenter for Employee Development (NCED) located in Norman, Oklahoma. The EMCM course can be delivered in your city through sponsorship by your PCC®. For more details about what is covered in the program go to our Curriculum page. Check out your local Postal Customer Council, too. They often hold educational seminars designed to help you ace these USPS courses! PCC is a terrific resource for education, the latest in Postal Service regulations and networking. I thought it would be a good idea to review a few of the terms commonly heard when working with either a presort service or directly with the USPS. If you have other terms you would like addressed, please drop us a line! Automation Compatible Mail – Mail that is prepared according to USPS standards so it can be scanned and processed by automated mail processing equipment such as a barcode sorter. Postage discounts are available to mail that is automation compatible. Bulk Mail – The term is generally used to describe commercial mail. The term “bulk mail” refers to specific minimum quantities of mail that are prepared as a specific class of mail at reduced postage. For instance, First Class Mail requires a minimum of 500 pieces for each mailing. Standard Mail requires 200 pieces or 50 pounds for each mailing. The term “bulk mail” is synonymous with commercial business, or advertising mail. Business Mail Entry Unit (BMEU) – The area of a postal facility where mailers present bulk and permit mail for acceptance. The BMEU includes dedicated platform space, office space and a staging area on the workroom floor. Presort service providers will present their mail to the BMEU for processing. At Strahm, the USPS picks up from our dock area since we have an on-site USPS Verifier and MERLIN for pre-approval. Certified Mail – A service that provides the sender with a mailing receipt. A delivery record is maintained by the USPS. This type of mail must be sent at First Class or Priority Mail prices. Certified Mail may be combined with return receipt service and restricted delivery service. Extra service fees are in addition to postage. Commingle – To integrate dissimilar mail into the same mailing. Presort service providers such as Strahm Automation commingle customers’ mail and offer postage savings. Delivery Confirmation – An extra service that provides the date and time of delivery or, if delivery was attempted but not successful, the date and time of the delivery attempt. Delivery confirmation is available for Priority Mail, First Class Parcels, Standard Mail machinable or irregular parcels, Package Services and Parcel Select packages. Please note that this service is not available for regular letter mail. Extra services are in addition to postage. Express Mail – A mail class that provides expedited delivery service. This is the fastest mail service offered by the USPS. Express Mail International Service is available between the United States and most other countries. Flat-size Mail – A flexible rectangular mailpiece that exceeds one of the dimensions for letter-size mail ( 11 ½” long, 6 1/8” high, ¼” thick) but that does not exceed the maximum dimension for the mail processing category (15” long, 12” high, ¾” thick). Flat-size mail may be unwrapped, sleeved, wrapped or enveloped. Letter-size Mail – A mail processing category of mailpieces, including cards, that do not exceed any of the dimensions for letter-size mail (11 ½” long, 6 1/8” high, ¼” thick). Permit Imprint – Printed indicia instead of an adhesive postage stamp or meter stamp. Shows postage prepayment by an authorized mailer. Postage Meter – A device that can print one or more denominations of postage onto a mailpiece or meter tape. It is available for lease only from authorized manufacturers. Presort – The process by which a mailer prepares mail so that it is sorted to the finest extent required by the standards for the price claimed. Generally, presort is performed sequentially, from the lowest (finest) level to the highest level, to those destinations specified by standard and is completed at each level before the next level is prepared. The USPS has released it’s rankings of cities with the highest incidents of dog bites. 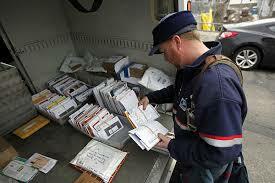 Last year the USPS reported 5,879 attacks nationwide. If your letter carrier considers your loose dog to be a threat, you will be notified that your mail will be available for pick up at the Post Office until the situation has been rectified. In the case of a dog allowed to roam the neighborhood, mail delivery to your neighbors may be halted. In addition, the Postal Service requests that dogs indoors be kept in a separate area away from glass or screen doors as dogs have been known to jump or break through these barriers. Working with animal behavior experts, the Postal Service has developed tips to avoid dog attacks and become better dog owners. Obedience training can teach dogs proper behavior and help owners control their dogs in any situation. 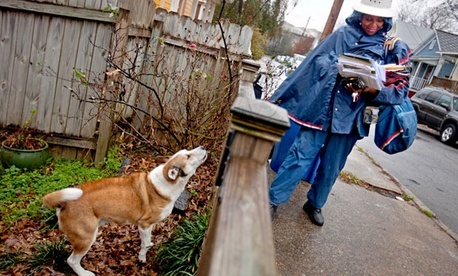 Dogs can be protective of their territory and may interpret the actions of a letter carrier as a threat. Please take precautions when accepting mail in the presence of your pet. When a letter carrier comes to your home, keep your dog inside, away from the door, in another room or on a leash. Don’t run past a dog. The dog’s natural instinct is to chase and catch you. If a dog threatens you, don’t scream. Avoid eye contact. Try to remain motionless until the dog leaves, then back away slowly until the dog is out of sight. Never approach a strange dog, especially one that’s tethered or confined. Anyone wanting to pet a dog should first obtain permission from the owner. Always let a dog see and sniff you before petting the animal. If you are knocked down by a dog, curl into a ball and protect your face with your hands. Dog bites are not only a USPS issue. Annually 4.7 million bites are reported – most of these occurring to children. Below are the statistics for bites by city for the USPS letter carriers. Please help our letter carriers perform their jobs in a safe and secure manner and keep your dog safe at the same time! It’s summer and the heat is making me lazy. 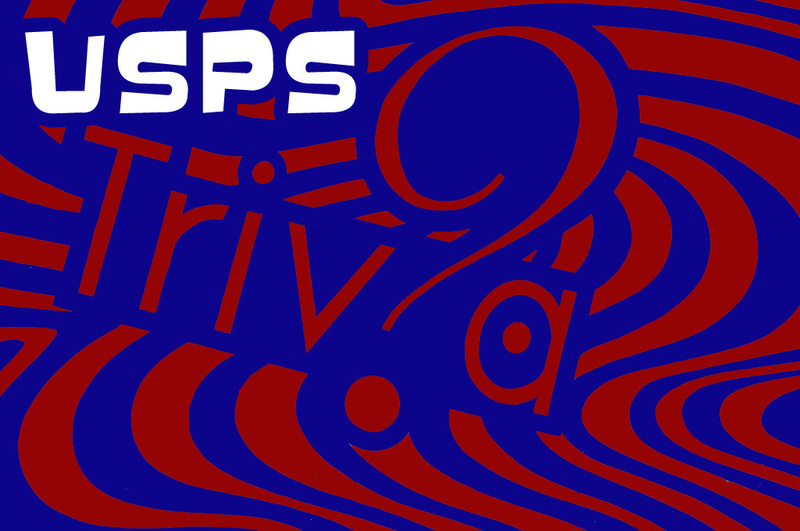 So I thought we would entertain you this week with some USPS trivia. The Peach Springs, AZ post office has walk-in freezers for food destined for delivery to the bottom of the Grand Canyon…the mail there is delivered by mule train! The Anaktuvuk, AK post office is the most isolated – it is the only link to the outside world for the 300 residents, and everything must be flown in; there are no roads there. One post office sits on the border between VA and TN, and serves the cities of BristolTN and Bristol, VA. Of course, this one post office has two ZIP codes, one for each city! Most Unusual Delivery Method – mule trains in Arizona. Each mule carries about 130 pounds of mail, food, supplies and furniture down the 8-mile trail to the Havasupai Indians, averaging 41,000 pounds per week. Another Unusual Delivery Method – dock-to-dock delivery on the Magnolia river in AL. Delivery is performed by a 17-foot mail boat, which delivers to 180 dock-side mailboxes along a 29 mile stretch of the river. The Postal Service has the largest gantryrobotic fleet in the world using 174 robotics systems to move 314,000 mail trays per day. The Postal Service is the world leader in optical character recognition technology with machines reading 93 percent of all hand-addressed letter mail. The Postal Service uses more than 8,500 pieces of automated processing equipment to sort nearly half the world’s mail. The Postal Service has one of the largest material-handling systems in the world for moving mail. There are over 200 miles of conveyors within postal processing facilities. The Flats Sequencing System (FSS) sorts “flat mail” (large envelopes, magazines, etc.) in carrier walk sequence at 16,500 pieces per hour. In 2011, the Postal Automated Redirection System (PARS) automatically intercepted and forwarded more than 2 billion pieces of mail for the nearly 40 million address changes submitted. The Advanced Facer Canceller System (AFCS) positions letter mail and cancels stamps at 36,000 pieces per hour. The Delivery Barcode Sorter (DBCS) reads the barcode on letters and sorts them at 36,000 pieces per hour. The Automated Flat Sorting Machine (AFSM) sorts flat mail at 17,000 pieces per hour. The Automated Package Processing System (APPS) processes packages and bundles of mail at over 9,500 pieces per hour. The Automated Parcel and Bundle Sorter (APBS) processes packages and bundles of mail at over 6,000 pieces per hour. For more postal trivia, check out Postal Facts 2012.